Our members have been quite involved in a number of projects and activities in Gungahlin and the wider Canberra Region. From sponsoring and hosting international exchange students, volunteering as staff at local community events and supporting local schools to helping on community projects such as the Gungahlin BMX dirt jump track by Yerrabi Pond. Our local activities are primarily focused on supporting youth in the Gungahlin area, through both the local schools and colleges and other projects through partner organisations. Here a local student’s community service towards an older resident being recognised in front of a very proud Mum. Below is the BBQ support we give to Carols by Candlelight by Yerrabi Ponds. The Rotary Youth Leadership Awards (RYLA) is a leadership training program for young people, run by local clubs. Youth aged 14-30 are nominated and chosen based on their leadership potential, then sponsored by local Rotary clubs to participate in a program. The program delivery varies, it can be a seminar, a camp or a workshop, though all focused on developing the leadership potential within young people in our community, learning leadership skills by tuition and practice. 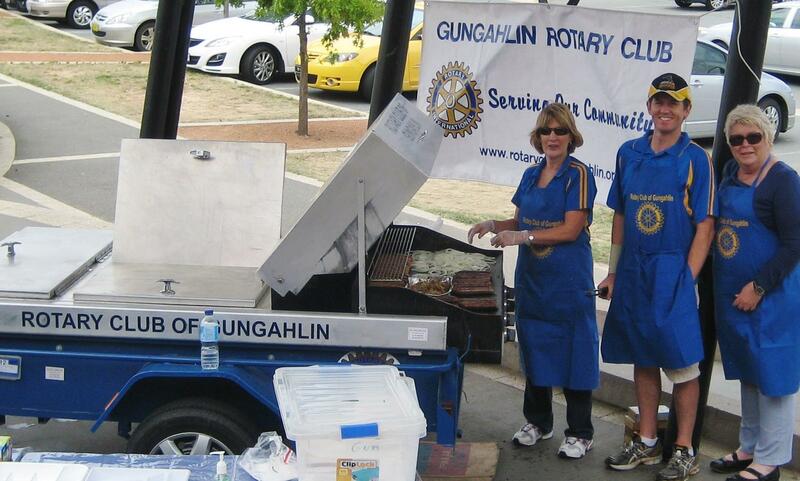 Rotary Gungahlin proudly supports RYLA by sponsoring youth in our community to participate in the program. We are always looking for more local things to support – we encourage both our new and old members as well as our friends to bring their ideas for projects and activities to support. NYSF is a fantastic program for year 12 students interested in a career in science. Supported by Rotary clubs including Rotary Gungahlin, the students learn how to make informed decisions about courses and careers in the sciences and gain a professional skill set to help them realise their potential. Rotary Gungahlin sponsors local students to attend the forum interstate or internationally, as well as hosts and chaperones interstate and international students to local forums. Our members also volunteer as organisers and support staff at the Canberra forum. For more information about NYSF, please visit the NYSF website. Please contact us to know more or share your ideas for local projects to support.